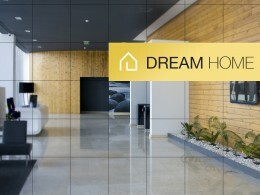 Dream Home HD uses the iPad as a means for exhibiting incredible home designs in picturesque showroom shape. The idea behind the app is incredibly simple. Apalon presents people with imagery of dream homes and we love it because it’s beautiful. 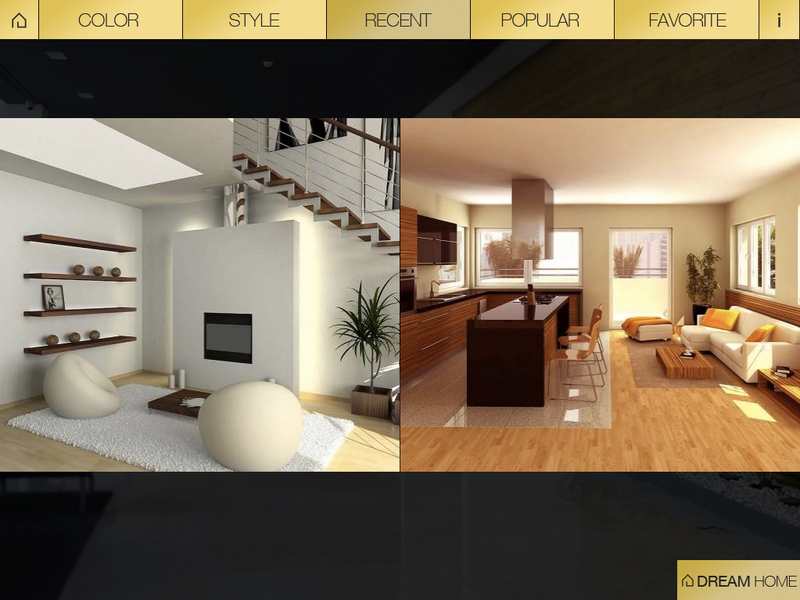 The first time you open the app you’re right in the thick of your choice between a series of dream home slideshows. The home screen organizes high resolution photo series by type so you can choose to focus on living rooms, bedrooms, kitchens, bathrooms, kids’ rooms, decor details, landscaping, floor plans, or hallways. If you’re more interested in another categorical organization, the app also includes buttons to organize images by color (white, yellow, brown, dark, green, red, tan, wild bright, and pink). 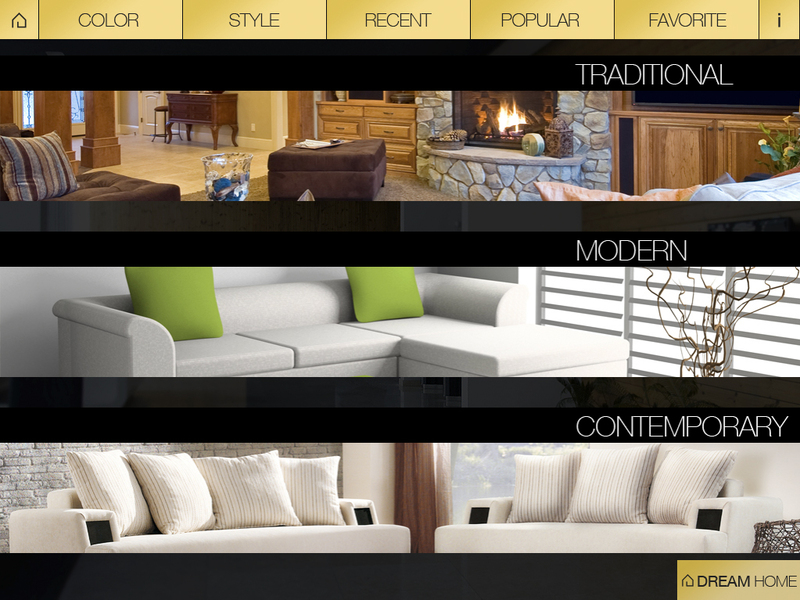 You can also press the style button to see images organized by traditional, modern, contemporary, country, art deco, shabby chic, tuscan, cultural, and eclectic design. Another menu button across the top offers quick access to recent images, designs you’ve favorited, and images that are most popular amongst other users. How you decide to navigate the categories is completely up to you, but the overall experience is the same regardless of whether you delve into dreamy imagery of warm multimillion dollar homes or photos that feel like they’ve been pulled straight from the Best of Dwell. Clicking on a category sends you into a mode where images cover about 2/3 of the screen in a side scrolling manner. Quick buttons that link to other elements in the app rest on the top toolbar, but clicking on an image sends you into a completely immersive landscape where the toolbar disappears and each image fills the entire iPad screen. You can swipe from one image to the next to scroll through the category and then click on the image to make the app’s signature gold menu appear again in the background. If you’re looking for more of a relaxed experience with Dream Home HD you can press the play button in the lower middle corner within a fullscreen slideshow. This allows you to create a slideshow pace, play music from your iTunes, set the transitions between images to fade, reveal, push, move-in, etc. Then you press start slideshow to see an immersive multimedia experience with the music of your choice. This is a great feature and seems like a great means for getting inspiration. You can also rate images in full screen mode by pressing the rate button on the lower left hand corner menu, but you’ll quickly realize that rate is actually the equivalent of giving the design a thumbs up. Clicking Favorite on the lower right corner favorites the design for later reference in your Favorites tab. You can still rate images in slideshow mode, but doing so pauses both the music and the presentation. Overall this isn’t a big deal, but it might be nice not to interrupt the flow. All in all this is a solid app. The organization of imagery is helpful, there seems to be quite a bit of inspiration (though I hope the collection grows consistently over time) and everything seems well curated. The integration with iPod is also a huge plus. It would be nice to have more filtering options (e.g. show me white rooms but no children’s rooms) and get more information on the designs themselves. Who created this design or where is that rug from for example, but then we’re getting into more of a catalog than an inspirational design app. 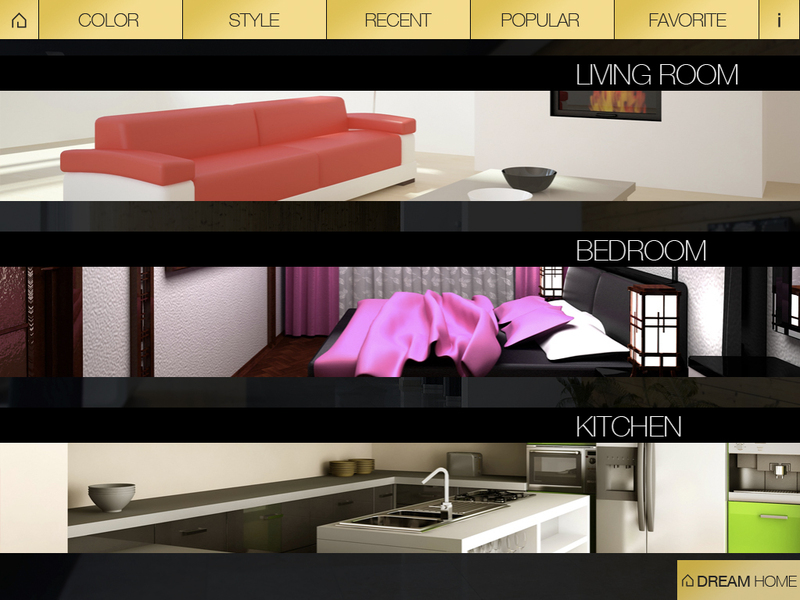 All said and done this app is exactly as advertised; a sortable gallery of aspirational home designs. Bottom Line: Dream Home HD delivers high quality imagery from beautiful homes in an immersive slideshow experience for the iPad.